Antique tractors will once again flood the streets of Moline for the 2016 Heritage Tractor Parade and Show. For the past four years, the John Deere Pavilion in Moline, Illinois, has hosted the Quad Cities Area Heritage Tractor Parade and Show. On Sep. 10, John Deere will once again play host as antique tractor and equipment owners are invited to register their 1970 and older models for the event. Registration and participation is free, and all brands, models and colors of tractors are welcome. Kristen Veto, manager of special events for the John Deere attractions, says, "Heritage equipment fans are a very dedicated and passionate group of enthusiasts and we love being able to offer an opportunity for collectors to showcase their pride and joy during this tractor parade and show. Not only is it a lot of fun for the collectors who participate, but visitors to the John Deere Pavilion that day will have an opportunity to see some remarkable pieces of equipment on display." In addition to the variety of antique farm equipment that will be on hand, John Deere will also be putting on blacksmith demonstrations to celebrate the steel plow. 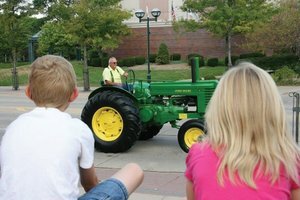 The tractor parade is scheduled to begin at 10 a.m. on Sep. 10 in front of the John Deere Pavilion, which is located on River Drive. The parade will progress to 19th Street, then on to 5th Avenue, and down 12th Street. The tractors will return to the Pavilion following the parade, where they be on display until 4 p.m. Interested antique tractor owners are encouraged to contact Kristen Veto at 309-765-1000 or by email at VetoKristenA@JohnDeere.com.